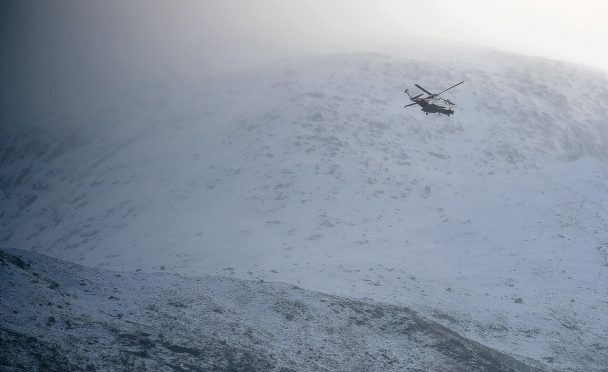 The Inverness coastguard helicopter on Ben Nevis. The men were near Tower Ridge on Ben Nevis when they got into difficulty on yesterday evening, raising the alarm to the local mountain rescue team around 5.45pm. The Inverness coastguard rescue helicopter 951 headed to help at around 9pm when the cloud had lifted and located the men a short time later. But the conditions meant the helicopter was unable to airlift them safely off the hill. The crew made several attempts throughout the night to rescue them but had no success. Members of Lochaber Mountain Rescue Team ventured up Ben Nevis on Wednesday evening. In the meantime, Lochaber Mountain Rescue team members searched on the ground. The exhausted group of rescuers and rescued eventually returned to base around 11am yesterday morning in what volunteers are calling an “epic” rescue. 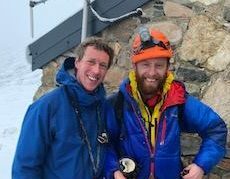 A spokesman from Lochaber Mountain Rescue Team said: “A busy few days for the team which culminated in a 18 hour epic which has just finished. Two climbers became crag bound after going off route on Tower Ridge. “The weather when the call out started was poor and we were not able to call on assistance of helicopter. Around 21.00 hrs the cloud lifted and we asked R951 if the could assist. “Team members continued climbing up to casualties and eventually located them slightly off route. The deep snow made finding safe anchors to descend difficult to find and significantly slowed down the descent. The casualties eventually were evacuated down to the CIC Hat at circa 11.00 this morning. Both men are believed to be uninjured.